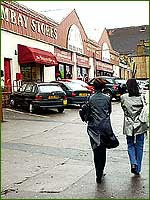 Bombay Stores in Bradford is the self proclaimed "UK's largest asian department store". It might just be the largest, but is it the BEST?? Here's my review!! Firstly...this store is massive! 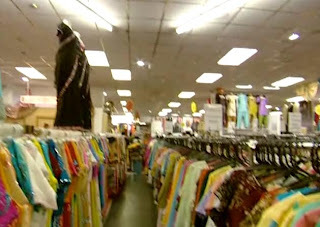 It packs a lotta stuff all under one roof, from ladieswear, bridalwear, kidswear, shoes, accessories, to music, make-up, house decorations, fabric, sewing patterns and a lot more. In fact there's so much that the only way to shop is to browse the store and pick up tickets for each item that you want to purchase, and when you're done you go to the checkout, give in your tickets and all your items will be ready to pay for and collect. So, let's move to ladieswear - this is a fashion blog after all! Well, you can check out a range of the stuff Bombay stores has to offer on their website: bombaystores.biz. Most of the ladieswear on that site is a bit out of date, but the "catalogue" section has the latest outfits. There's LOADS more instore, from your basic everyday suits to stuff a bit dressier, to over-the-top-embroidered party wear, and bridalwear. There's quite a good price range, so if you're on a budget you'll probably still be able to pick something...although I warn you it won't be as pretty and amazing looking as the pricier items!! In addition to the readymade suits, there's also a VERY large fabric section of the store, including trims, threads and sewing patterns. Ah the bridalwear section of the store..it's like it's own little world away from the rails packed with clothes (even though it's not that secluded, in fact it's right next to those very packed rails). I paid a short visit to the bridalwear section this weekend, but as I wasn't in a position to buy, I didn't stay very long! I did however take a peek at a future bride with her entourage trying on various outfits - I just couldn't help but look! I didn't get the chance to do a full bridalwear price-check, but judging by the items I did see, I'd say prices start at about £1000 and can go A LOT higher! The shop assistant said the outfit and accessories came to about £3000. Bombay stores stocks Unze shoes and Paposh shoes. Nothing extraordinary about that, but it's very handy if you've just bought an outfit and you want some matching shoes and a bag. There's also other accessories such as bindis, henna, henna tattoos, jewellery. Not exactly my area of expertise, but Bombay stores has loads of menswear, in different colours, fabrics and styles. Bombay stores also offer wedding services, more details by clicking here, as with the menswear I haven't tried all of these out, but I can tell you about the wedding stages and wedding invitations. 1)Wedding Stages - the last time I used this service they were really professional, we picked a stage we liked, told them our requirements such as height of stage, colour of lighting etc. and arranged for it all to be set up at the venue. All went smoothly, without hassle and most importantly ON TIME! 2)Wedding Invitations, unfortunately my last experience of ordering wedding invitations with this company wasn't such a smooth process. They got the basics right, such as spelling of names, addresses, phone numbers, however they messed up on the design and we had to change our initial idea. Also, not all the invites were of the same quality, some of them were downright illegible! One last little gripe - we had to fold the invitations ourselves, which can be a bit of a hassle when you're stressed out of your head organising a wedding!! I ordered it in blue, for half the price listed on the site. I ordered it about a week before Christmas, so wasn't expecting it to arrive until January because as the site states "delivery may take up to two weeks". So imagine my surprise when it arrived 3 days later! The ordering process was easy, it took me 5 minutes. The suit was just like the picture, the size fit perfectly and needless to say I'm pretty pleased with my purchase. I would have probably ordered this outfit too...if only it was in stock! Overall, I think Bombay Stores is fab. I probably wouldn't go shopping there every week, but if you visit occassionally, chances are you'll find something. the birthday girl you saw was on MTV's sweet 16 birthday bashs!! I agree with the review. Bombay Stores has everything you could ask for. I got married last year and they made every aspect of my wedding so easy. I was so pleased. They sorted everything out from my outfit to my husbands. They even sorted out my brothers and all the other guys for my mehndi. What they do is unique and i would recomend this store to everyone.